Great Service, fantastic food, and friendly people! I had 25 people scheduled for dinner at my house on Saturday night, but at 4am Saturday morning, the flu hit. Ugh!!! By noon I realized I would not be able to make that homemade lasagna, so I called Hogzilla, and they saved the day! My husband picked it all up on the way home from work, and the party went off without a hitch, a good time had by all! (Except me, who ducked off to bed at 8:30!) Really happy with the food, the willingness to take a late order for the same day, and the awesome service. 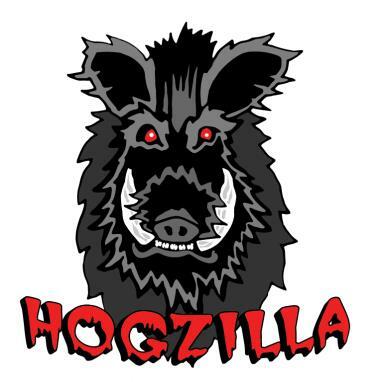 Thank you, Hogzilla! They were great to work with. Food was ready on time and plentiful for my event. Thought the ribs could have been cooked alittle longer, loved the smokiness on the pull chicken and mac and cheese... the ribs fell short.. all an all, great service! The food was excellent. Quantity perfect. Packaged very nicely. We had a Christmas party and the food was a hit! Everything was fantastic! I was not at the meeting but I heard lots of wonderful comments, including - One of the best catered meals I've ever had! Thanks! Office Luncheon catering for 12 guests. We're a Smoked BBQ Caterer specialist that just served them our Big Piggy Party Pack with Fresh Pulled Pork, Sliced Beef Brisket, Orginal BBQ Sauce on it, Original BBQ Sauce on it, Grannie Mac & Cheese, Creamy Coleslaw, No Additional side, No Additional side and No Additional side. Pickup catering for 36 guests. We're a Smoked BBQ Caterer specialist that just served them our Big Piggy Party Pack with Pulled Chicken, Fresh Pulled Pork, Orginal BBQ Sauce on it, Original BBQ Sauce on it, Hogz BBQ Beans, Grannie Mac & Cheese, No Additional side, No Additional side and No Additional side. Just did another Drop Off Catering. We're a Smoked BBQ Caterer specialist that just served them our Big Piggy Drop Off Party Pack with Fresh Pulled Pork, Pulled Chicken, Orginal BBQ Sauce on Side, Sweet BBQ Sauce on side, Grannie Mac & Cheese, Hogz BBQ Beans, No Additional side, No Additional side and No Additional side, Canned Sodas, Canned Sodas and Canned Sodas. Office Luncheon catering for 10 guests. We're a Smoked BBQ Caterer specialist that just served them our Little Piggy Party Pack with Fresh Pulled Pork, Orginal BBQ Sauce on it, Grannie Mac & Cheese, Hogz BBQ Beans, No Additional side, No Additional side and No Additional side. Employee Appreciation Luncheon catering for 25 guests. We're a Smoked BBQ Caterer specialist that just served them our Fresh Pulled Pork By The Pound with Sweet BBQ Sauce on Side, Pulled Chicken by the Pound with Orginal BBQ Sauce on Side and Grannie's Mac & Cheese by LB. Anniversary catering for 60 guests. We're a Smoked BBQ Caterer specialist that just served them our Little Piggy Party Pack with Fresh Pulled Pork, Orginal BBQ Sauce on it, Grannie Mac & Cheese, Spaghetti W/Brisket mushroom sauce, No Additional side, No Additional side and No Additional side and Smoked Wings by the Piece. Training Class Luncheon catering for 30 guests. We're a Smoked BBQ Caterer specialist that just served them our Little Piggy Drop OFF Party Pack with Fresh Pulled Pork, Orginal BBQ Sauce on Side, Creamy Coleslaw, Hogz BBQ Beans, Farmer's Market Vegetable Medley, No Additional side and No Additional side. Drop Off Catering for 20 guests. We're a Smoked BBQ Caterer specialist that just served them our Pulled Chicken by the Pound with Orginal BBQ Sauce on Side, Buns bulk, Grannie's Mac & Cheese by LB, Creamy Cole Slaw by LB and Fresh Pulled Pork By The Pound with Sweet BBQ Sauce on Side. Office Luncheon catering for 15 guests. We're a Smoked BBQ Caterer specialist that just served them our Big Piggy Drop Off Party Pack with Fresh Pulled Pork, Pulled Chicken, Sweet BBQ Sauce on Side, Original BBQ Sauce on side, Hogz BBQ Beans, Potato Salad, No Additional side, No Additional side and No Additional side, Canned Sodas and Brownies. Office Luncheon catering for 15 guests. We're a Smoked BBQ Caterer specialist that just served them our Big Piggy Drop Off Party Pack with Pulled Chicken, Sliced Beef Brisket, Orginal BBQ Sauce on it, Original BBQ Sauce on it, Hogz BBQ Beans, Grannie Mac & Cheese, Toss Salad, No Additional side and No Additional side. Wedding catering for 25 guests. We're a Smoked BBQ Caterer specialist that just served them our Big Piggy Party Pack with Sliced Beef Brisket, Smoked Chicken Wings, Orginal BBQ Sauce on it, Original BBQ Sauce on it, Grannie Mac & Cheese, Hogz BBQ Beans, No Additional side, No Additional side and No Additional side. Other catering for 20 guests. We're a Smoked BBQ Caterer specialist that just served them our Grannie's Mac & Cheese by LB, Cornbread bulk, Fresh Pulled Pork By The Pound with Orginal BBQ Sauce on it, Real mashed potatoes n gravy and BBQ Sauce. Office Luncheon catering for 10 guests. We're a Smoked BBQ Caterer specialist that just served them our Big Piggy Party Pack with Fresh Pulled Pork, Pulled Chicken, Orginal BBQ Sauce on it, Original BBQ Sauce on it, Potato Salad, Grannie Mac & Cheese, No Additional side, No Additional side and No Additional side.